Sorry about the lack of new posts the last few weeks but I was over in England for a few weeks visiting my girlfriend Gemma. I just got back on Friday so the blogging will be picking up quite a bit. Expect to see a lot of England centric posts over the next week or two. I am also competing in a Rib Off on August 24th and will be keeping you updated on the process of determining the rub, sauce, or glaze I will be using as well as the cooking process and contest results. I also have another project in the works that I am working on and will reveal more later on. Stay tuned for the exciting stuff coming up on Smartchefblog! In light of the devastating tornado that hit Oklahoma yesterday I just wanted to post some links to where you can go and donate to help with the relief effort. Thoughts and prayers go out to all those affected by yesterday’s storm. Be generous these people can really use the help right now. Week 4 has been my favorite class so far. First we were taught how to scale and skin a fish. Then, instead of following a recipe from the book the chef taught us a few techniques how to cook fish; grilling, sauteing, and butter roasting. After going over these techniques we were able to experiment with seasonings and sauces to pair with the fish. I chose to butter roast snapper fillets. I seasoned the snapper with white pepper, salt, cayenne pepper, dill, and Spanish paprika. I then preheated the pan. As the pan was heating I lightly coated the fish with canola oil, then when the pan was hot I placed a tablespoon of oil in the pan. I then placed the fish in the pan, turning the heat down after 30 seconds. When the fish turned white halfway through I flipped the fish and added 4-5 tablespoons of butter to the pan and turned down the heat. As the butter melted I basted the fish with the butter for 1-2 min until the fish was done, squeezing lemon juice over the fish at the very end. After removing the fish from the pan I drained out most of the butter and added a chopped shallot and garlic. I then deglazed the pan with white wine and reduced it by 3/4. After reducing the wine I added spinach and sauteed the spinach. 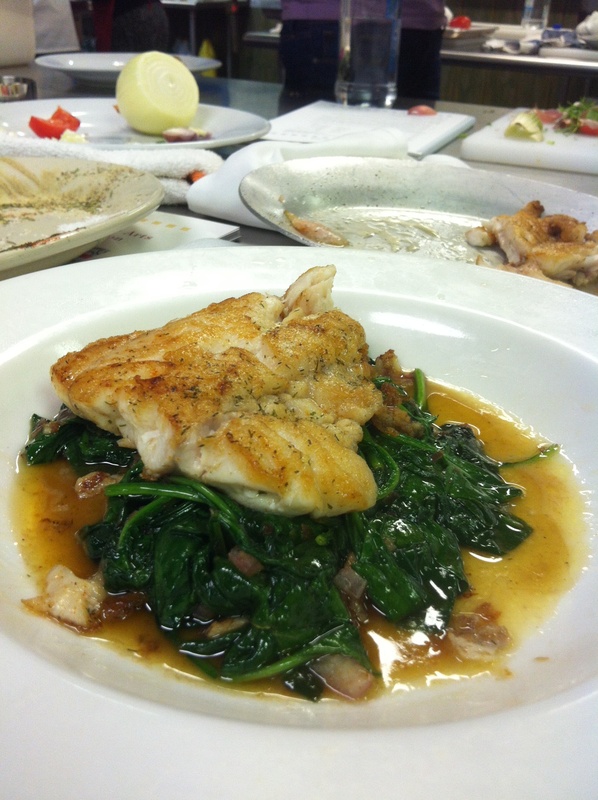 I served the fish over the spinach. Tonight I continued my series in cooking with beer. The beer featured in this recipe is the Blue Heron pale ale from the Mendocino Brewing Company in Saratoga Springs, NY. I chose their pale ale because I thought its flavor would work better with chicken. Their beer is also great for drinking. The pale ale very good but my favorite beer the have is the red tail ale. The recipe for the sauce has the same proportions for many of the other pan sauces I have made. You can get creative and switch out different ingredients to build new flavors. Their pale ale and the bacon in this sauce worked great with each other and built a very complex flavor into the sauce. You can also use this sauce with beef or pork. However if you are making it for beef substitute beef broth for the chicken broth. You can find the recipe below as well as a link to the Mendocino Brewing Company’s website. Week three of the cooking class focused on game birds like duck, pheasant, and quail. At the beginning of the class the Chef talked us through all the different kinds of game birds and how their tastes differ. The techniques for breaking down the game birds were the same as the techniques we learned in week one with the chicken. I impressed myself and remembered the proper way to cut a bird in the European style. 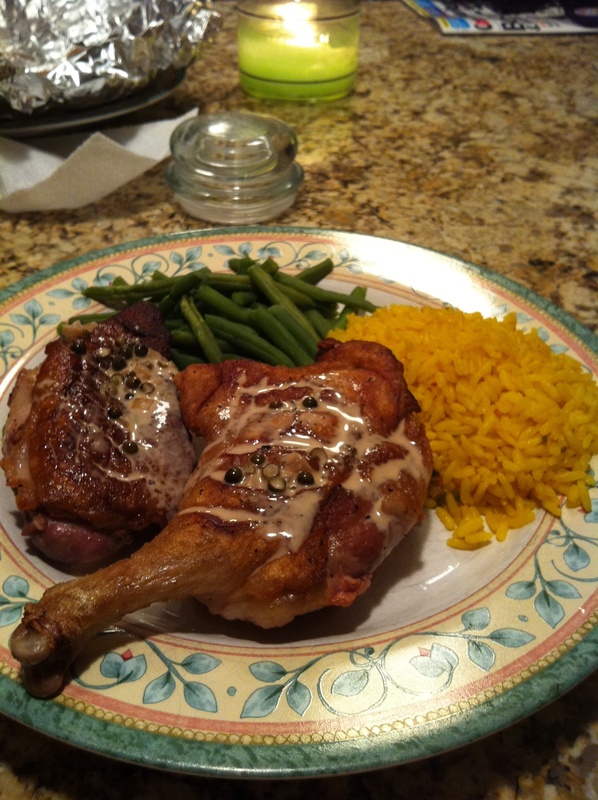 The dish I decided to cook was the Margret De Canard Au Poivre Vert, which is a pan cooked Muscovy duck with a green peppercorn cream sauce. 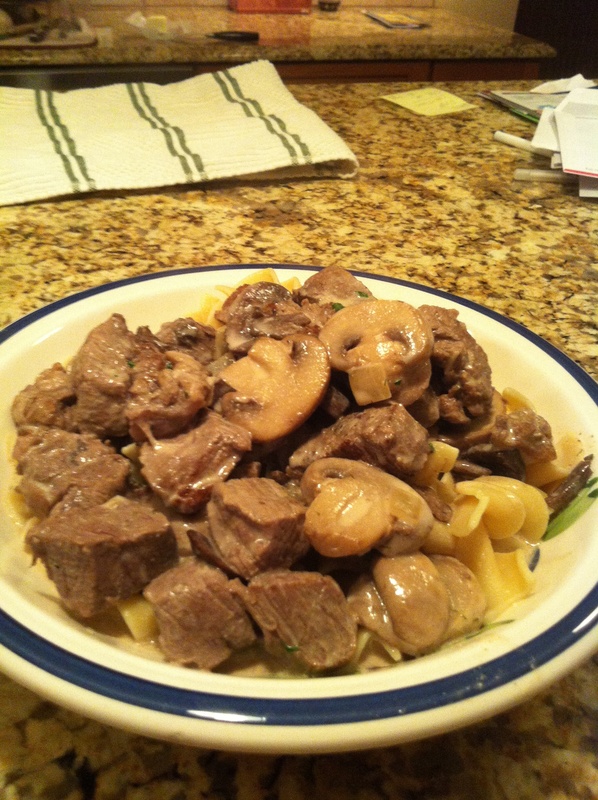 Last Night I made the Beef Stroganoff recipe we were given at the cooking class on Monday night. To warn you in advance this recipe is all about taste, not so much on being healthy. It calls for quite a bit of heavy cream and sour cream. This dish is very rich and is perfect for a cold day. I’m a bit short on time so I will update this post and add the recipe next week. I’m away this weekend so there will not be any posts for the next few days. 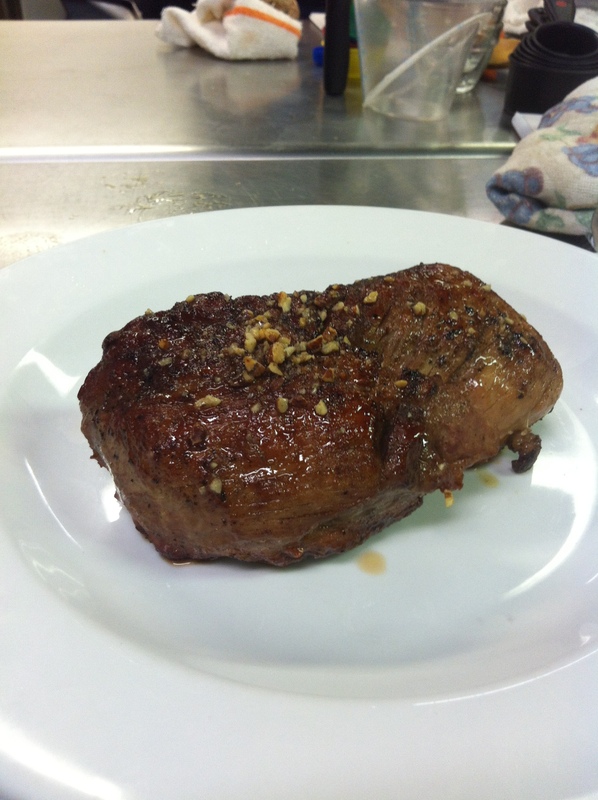 In week two of the cooking classes we learned how to prepare and cook various forms of meat. The class started with a talk about the various types of each meat, ie the difference between choice and prime cuts of beef. We were then walked through where on the animal various cuts of meat came from. After the short lesson the chef taught us how to prep and French a rack of lamb and prep a pork and veal tenderloin. Then we got into the cooking. 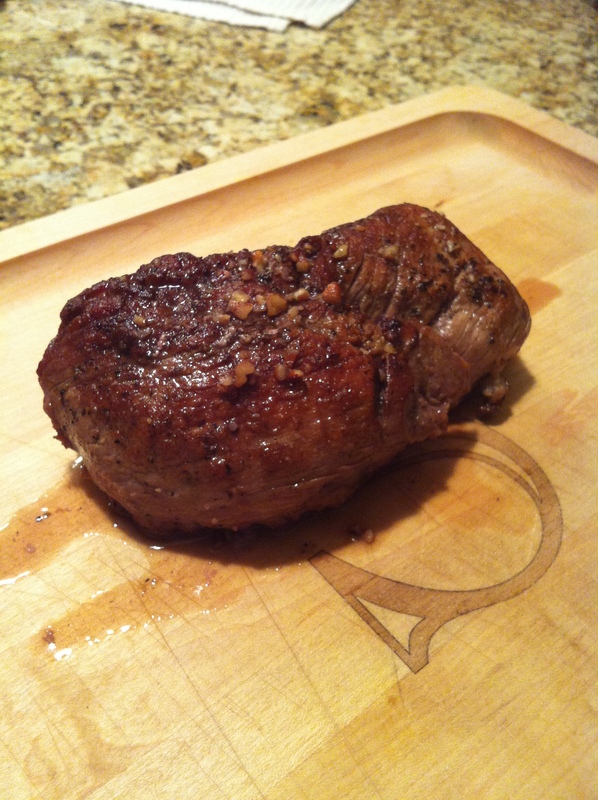 I chose to cook a roasted veal tenderloin with a maple bourbon glaze, Ben I’m sorry about the veal. One skill I will take away from this recipe was learning how to properly sear a piece of meat. From properly preheating the pan to the proper time to flip the meat. The chef was very good about answering any questions we had during the class. A few of the other dishes from the class that stood out were the beef stroganoff, the Thai curried pork, and the tri tip that the head chef prepared for us. I look forward to trying out those dishes in the near future. I went back and updated two of the recipes. I just wanted to improve a few things from the first time I made them. Most of the improvements are small but make a big difference in the finished product. Enjoy! Continuing on with my homework assignment from the cooking classes, I took the chicken carcass from the other night and made a chicken stock. The recipe is very simple, the only difficult part of the recipe is that it takes 4-5 hours to make. You can use the stock as a soup or you can use it in sauces or other dishes you decide to cook. If you have the time I would recommend trying to make your own chicken stock. Update: Sterling Duns Mixtape Now Avaliable!!! Are you looking for some good music to listen to while you cook? Or just good music to listen to in general? if you are go check out my man Sterling Duns at www.hardworkmovement.com you won’t be disappointed. He plays guitar, raps, sings, and cracks jokes to just brighten your day. Tell your mom, dad, sisters, brothers, friends, grandmas, grandpas, everyone you see to go and check him out. Today he releases his second mixtape: Gift Wrappin’ you can download the mixtape HERE. You can follow him on twitter @SterlingDuns or like him on Facebook. Now go and download the mixtape, he’s just following his dream putting out good music for good people.